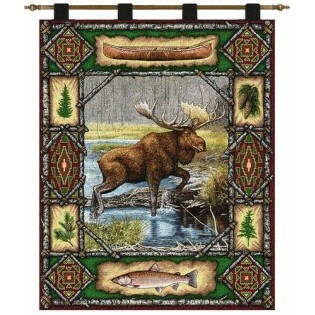 Add the finishing touch to your lodge decor with our Moose Lodge wall hanging, It features a large moose wading through a stream and has a decorative border with fish, canoe, pinecones and pine trees. 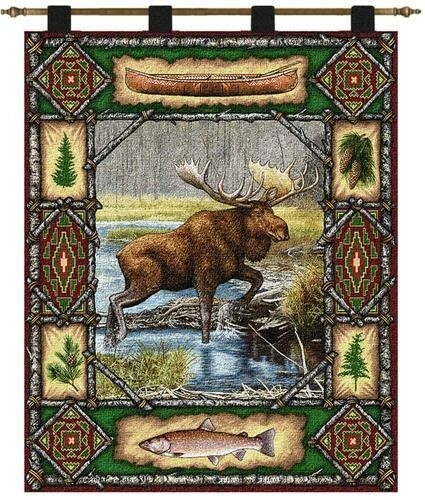 Add the finishing touch to your lodge decor with our Moose Lodge wall hanging, It features a large moose wading through a stream and has a decorative border with fish, canoe, pine cones and pine trees. Colors include dark green, brown and beige.